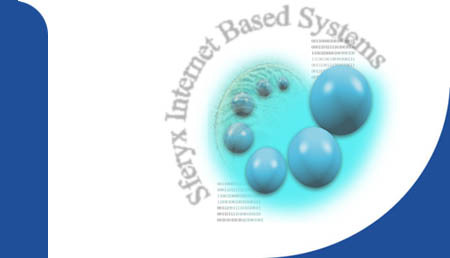 Founded in 2000, the Sferyx company operates in the field of the Internet based systems and develops sophisticated components and tools for developers and enterprises. The production policy of Sferyx is based on the priority of the software components and products development in accordance with the tendencies and prospects of the software market in the next 3 – 5 years. The Sferyx team includes professionals with long developer and design experience in the creation of software components and systems. - Complete solutions based on advanced industrial software products delivered by Oracle corporation, Sun Microsystems, etc. - Target operating environments: Microsoft Windows, Mac OS X, Linux, Sun Solaris, HP UX, etc. The quality level of the Sferyx software production can be evaluated to correspond to the requirements of ISO 9001. Sferyx has started the process to obtain the ISO 9001 certification. Partners & Resellers. The business policy of Sferyx is based on the partnership and the use of large network of resellers in accordance with the resellers program. Support. All customers, partners and resellers of Sferyx are assured with multilevel support system, studied to provide fast and qualified support to each problem. The system is projected to be highly automated and to avoid loss of time and resources to anyone. Investor relations. Being privately held company Sferyx is interested to attract investment capital to accelerate the realization of the software component production program, promising to guarantee high return rates on the invested capitals.